Handsome Lectern Bible Leaves from Paris ex Otto F. Ege. Two folios on vellum. Northern France, probably Paris, ca. 1300: approx. 407 mm x 267 mm (288 mm x 185 mm). Double column, 50 lines. Unfoliated. Decoration: fol. 1, three bar borders with ivy leaves and gold bezants in red and blue with with-lead highlights and three three-line dentelle initials; fol. 2, four bar-borders, one incorporating two animal drollery faces. 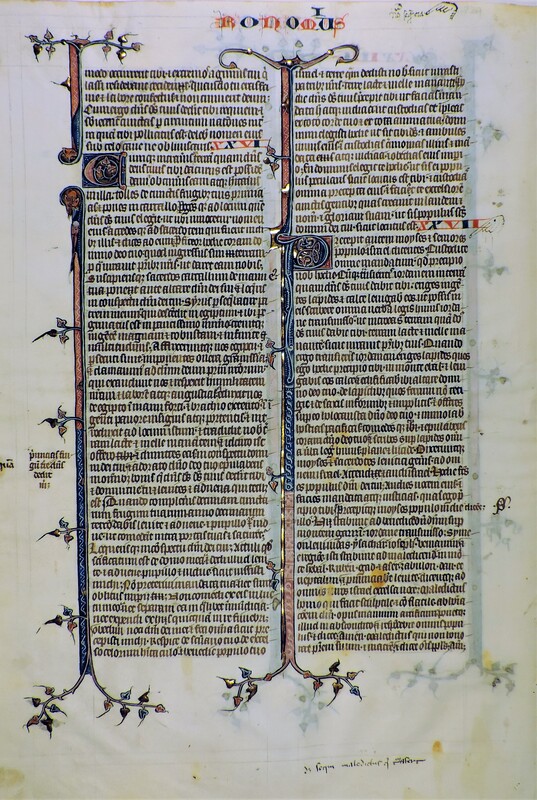 Maniculae and marginal annotations for lessons divided by day. 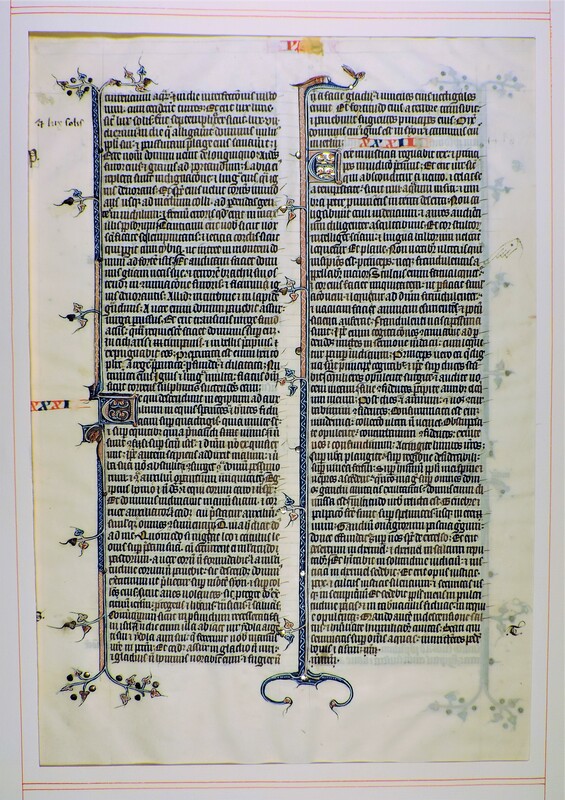 Historiated initials from the manuscript were lately said to be Paris work of ca. 1300. Text: fol. 1, Isaiah 29.13 quod appropinquat … Isaiah 31-32 (both complete); fol. 2, Deuteronomy 24-26 (complete), 27.1-16 (complete through the end of the verse). The Deuteronomy folio has an interesting annotation that reads “non sequencia” in the upper margin and “maledictus qui transfert” in the lower. This seems to refer to a manicule opening chapter 32. Provenance: unsold at auction in 1948 (Parke-Bernet, 29 November 1948 lot 326), apparently acquired by Philip C. Duschnes and “shared” with Ege. According to a note on a leaf now in the Schøyen Collection (London and Oslo), the manuscript was once owned by the lawyer and judge Mirmellus Arnandi and left to a Dominican house in 1450. See S. Gwara, Otto Ege’s Manuscripts (Cayce, SC, 2013), Handlist 14. This is one of Ege’s most widely dispersed manuscript fragments, and it appeared in his Fifty Original Leaves portfolio issued posthumously around 1953. Condition: both fine, mounted in original mats with prices: $65 and $68.